I recently wrote about the endowed progress effect, which makes us more likely to complete progress towards a goal if we have the impression that we’ve already begun taking the necessary steps. For example, people who get 2 free stamps on a “buy 10 get 1 free” card are more likely to put in the purchases needed to earn the freebie –even more so than people who got no free stamps but needed two fewer stamps to qualify. Valve, the masters of digital distribution and the art of Steam, recently illustrated another application of the endowed progress effect when they launched The Great Steam Treasure Hunt. The idea is that you earn Steam-based achievements by completing game-specific tasks such as earning a score of 1,124,400 in Chime, which just happens to be on sale for $1.25 today. 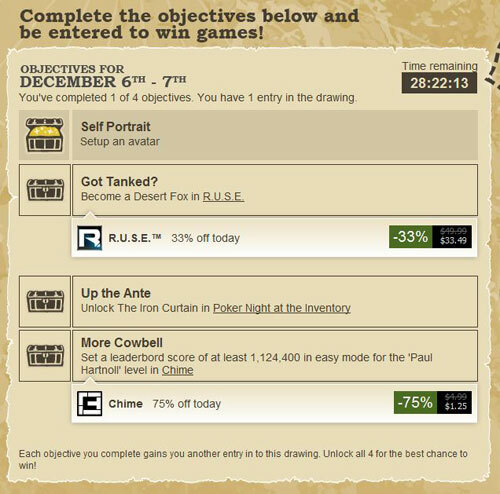 1 Earn any ten of these achievements and you get entered into a lottery for 100 free games. You can also earn progressively cooler Team Fortress 2 hats by completing any 5, 15, and 28 Treasure Hunt achievements. Bam. Endowed progress effect. Well played, Valve. Well played. 1. Coincidence? I THINK NOT. It’s smarter than even that. They also make you put 10 items in your wish-list to qualify — just before the holidays (A friend could gift you one or all the items on the wish-list). The wish-list is also a relatively new feature. You can also get an entry by just finishing one task every day. To get a final entry, though, you’ll need at least two achievements on at least two days, which means that every day the pressure to buy a game to get an entry gets greater.